So glad it’s finally Friday! Woohoo! Big plans for the weekend? Not sure what I’m doing yet, but I know it will involve enjoying the outside. 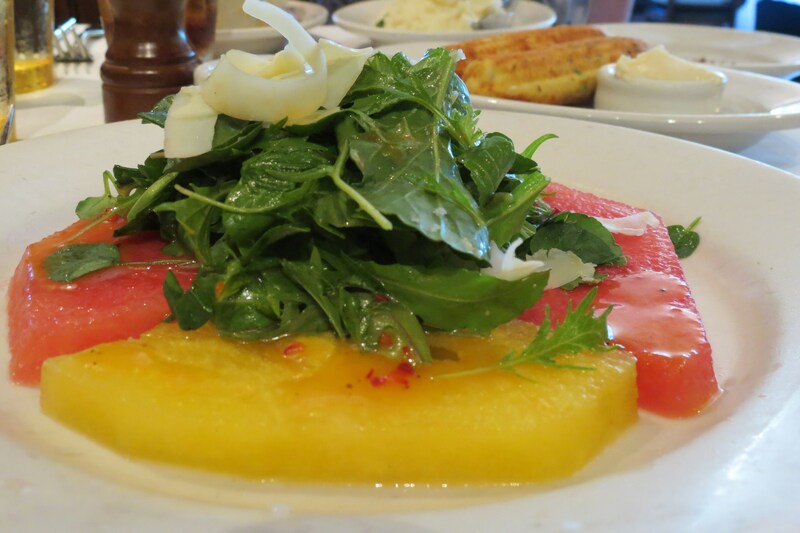 Remember last Saturday when I went to Napa Valley and had that wonderful Watermelon Salad? Well I just had to re-create it Peanut Butter and Peppers style! So you could do a little comparison in looks here is the salad I got in Napa. They used a yellow and pink watermelon. I couldn’t find yellow, normally I find it at the stores in July and August. Have you ever had a yellow watermelon? They taste pretty much the same, but tend to scare people who don’t like different. I used a personal size watermelon, that’s why the slices are smaller, which is ok for me, It made it easier to cut. I bought a large watermelon a week ago and it went to waste. My Husband and I could only eat so much watermelon in a couple of days. I should have froze it, but I didn’t. The personal size watermelon was so sweet! Just perfect! I bought it, where else? Trader Joe’s for $1.99! They never disappoint me!! For the cheese I decided to use a soft goat cheese that I could crumble over the top. I like softer cheeses rather than harder ones. To me it added more lightness to the dish and it went really well with the dressing and fruit. The dressing was the hardest part for me to figure out. I don’t recall that the dressings tasted the same, but I’m happy with mine. I used Trader Joe’s Orange Muscat Champagne Vinegar with some olive oil, salt, pepper and ancho chili powder. The dressing to was very light. I decided to just add the dressing to the arugula. I didn’t want to saturate the salad. I also let it sit for about 5 minutes before I ate it, that way the flavors soaked in. Plus to take pictures the salad ended up sitting. I really love this salad! I wanted to make it again, but oddly enough all the watermelon got eaten before I could. But for sure it’s going to be on my menu this weekend!! I served this salad with a little bit of homemade seed oat bread, which really filled me up. This salad may seem small, but watermelon, even though it’s mostly water really fills you up and keeps you full. Plus this salad is completely guilt free!! The calories were only 180, not to shabby. I am sure it was less than the restaurants. 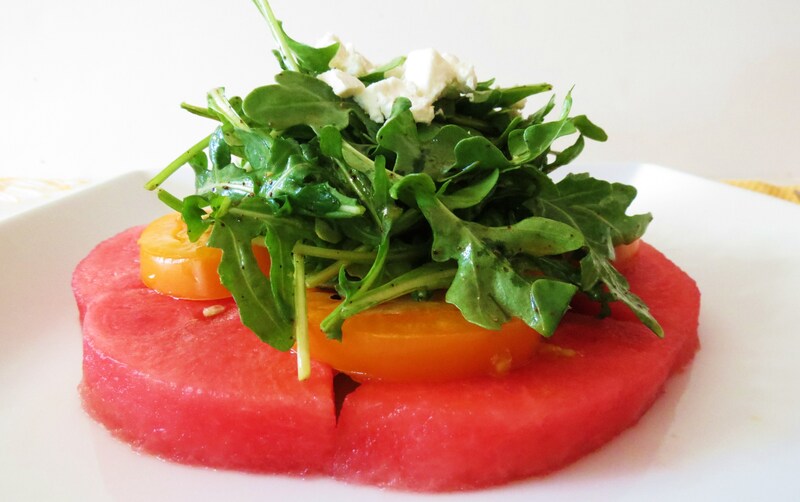 A light summary salad made with fresh watermelon, heirloom tomatoes and topped with arugula and drizzled in a Champagne Vinaigrette. On a plate arrange your watermelon slices, top with tomatoes. In a bowl, add arugula, champagne vinegar, olive oil, salt, pepper and chili powder. Mix well. Add to the top of the tomatoes. I don’t eat out too much, but I love when I do. Not because I don’t have to cook, but it gives me wonderful ideas for meals I can create at home. I look forward to my next outing because your never going to know what new foods or recipes you will discover. Speaking of food, ok what else do I talk about? 🙂 Time for me to make dinner this evening. Not sure what it will be yet, but maybe I’ll let my artistic juices flow and come up with another fun meal. I’m thinking something grilled?! That looks so delicious! I’m starting to a have few tomatoes from garden so I think I will make this today. Just have to get a watermelon! I’m not sure about the goat cheese, never had it, is it a mild cheese? Thanks for posting this recipe, I love all your recipes!! Have a great weekend!! Good morning Amy! Goat Cheese is a mild cheese, but if your not sure if you will like it or you want to try something else, I would recommend feta cheese. I think that would be nice on this salad. Your so sweet! Have a great weekend yourself!!! This is so pretty and looks so refreshing! Stunning! This is my kind of salad!! I like the little watermelons too, there so nice and not wasteful, not to mention they have a sweeter flavor. 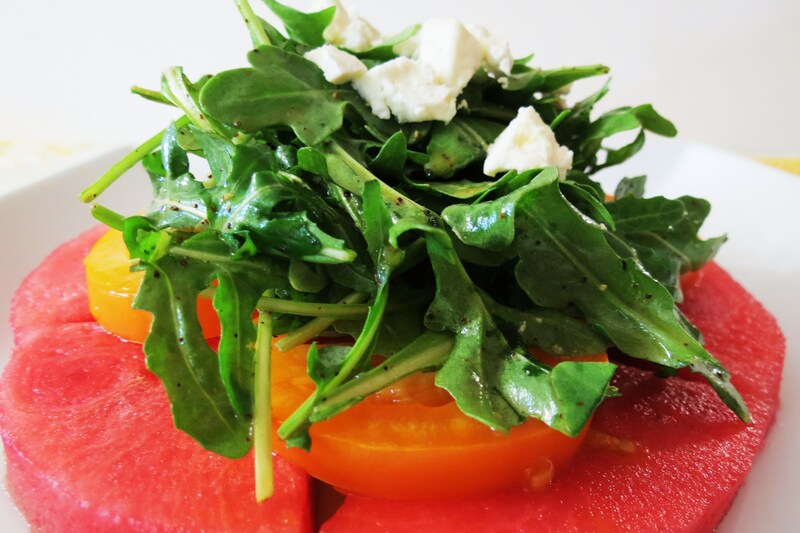 Watermelon, arugula AND goat cheese-I want to eat this now! What a refreshing Summer salad bursting with flavor. Thanks Laura! 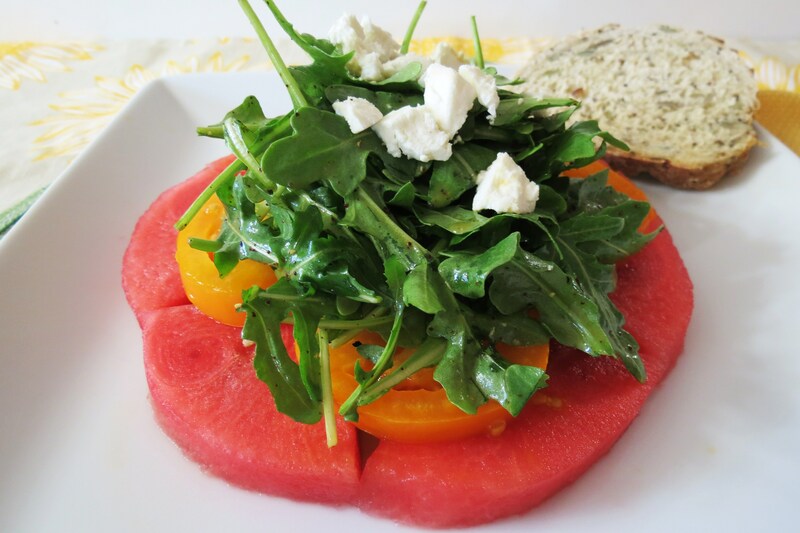 I am loving this salad, so simple, wonderful flavor combination! Wow, this is my kind of salad. I can tell you this is going to be lunch today. Delish and beautiful. I am loving this salad! It is so summery and I would love some tonight because it is 90 degrees here! So pretty as well :)! Oh thanks! You should give it a try over the weekend! Yum! Meets my criteria for a good recipe: Simple to prepare, Healthy and Delicious! Thanks Kelly! This is one of my new favorite salads!! I just saw those big watermelons at TJs, I might have to get one next time I go to try your salad-it looks so delish! I love watermelon and tomato together! Me too! After having that salad I would never of thought of that combo! What a beautiful and fabulous salad! 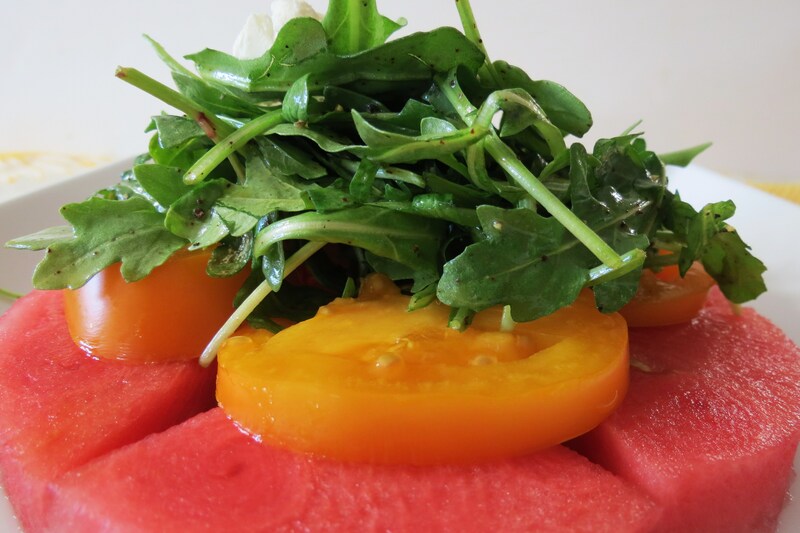 Love the combination of watermelon and tomato and your vinaigrette sounds perfect! Thanks, it’s my new favorite salad!! Very light and refreshing! 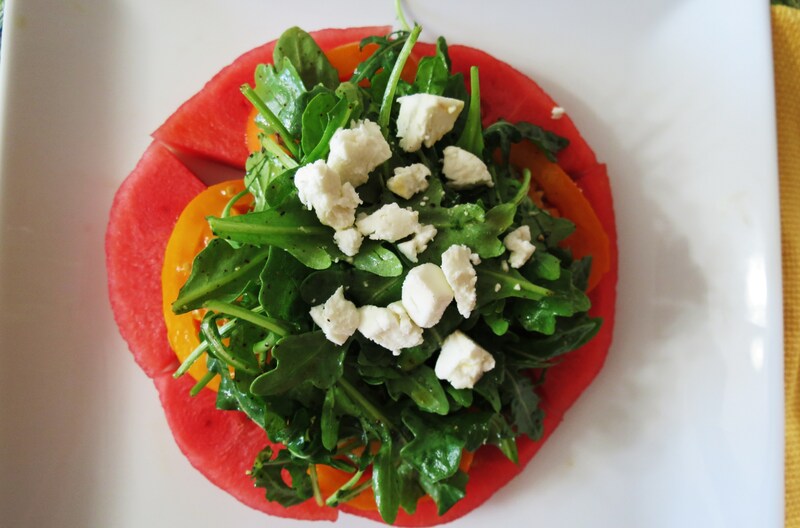 What a perfect summer salad and so pretty!! Thanks Beth!!! It’s so yummy! making it again! I already picked up my watermelon! This summery salad looks so divine!! Thank you for sharing at Fit and Fabulous Fridays!! Thank you for having me!!! Love Fit and Fabulous Fridays!! I’ve never had the courage to mix fruit with savory in such a bold way. It looks like the flavors would be really interesting. I would love if you would share this on my foodie friday party today. I will pin it too. Thanks Diane, I linked up to your party!! I love fruit with meat, but the cherries were overly sweet so your not getting a real sweet hamburger! There a perfect match! Be daring and try it!! At least try it on one burger! 🙂 I was surprised how much I loved it! I think my Husband was surprised too! Wow, this salad looks amazing! I love the combination of flavors too! 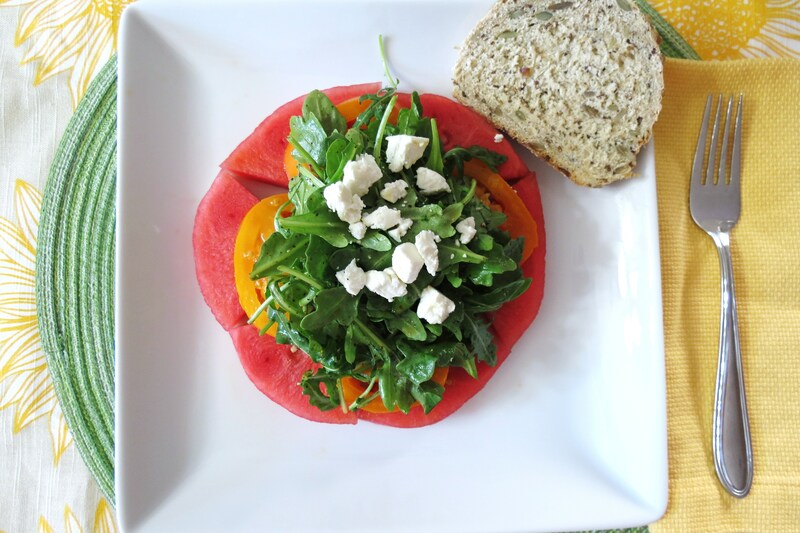 I’m hosting a weekly link up over summer specifically for salads of all types, every Sunday! I would love you to come and post this recipe. Just stop by my blog on Sunday – the link will be up! Thanks Debbie for the invite! I scoped out your site and I love it!!! I’ll stop by on Sunday!! Congrats your salad is being featured today on foodie friday. Stop by and pick up your featured button. Have a lovely weekend. Thank you so much for having me!!! You have a great weekend! What a beauty!! Sooo light and fresh NEED this! I love this salad! I tried it at a restaurant and fell in love with the flavors. I can’t wait till watermelon season!